Confronting us with the devastating divisions that helped provoke last year’s Brexit vote, here is a shatteringly sombre social-realist drama that moves away from the traditional inner-city environment regularly frequented by the likes of Ken Loach, and rests its focus on rural Somerset’s stark landscape. Set mere months after the winter floods that decimated the Somerset Levels back in early 2014, The Levelling follows Clover (Ellie Kendrick), a trainee vet who returns home to the family farm after the death of her brother. There she is faced by the shocking aftermath of the rains; the house is in ruins, many of the fields remain waterlogged, and her estranged father, Aubrey (David Troughton), looks to be edging closer to the end of his tether as he endeavours to keep calm and carry on. 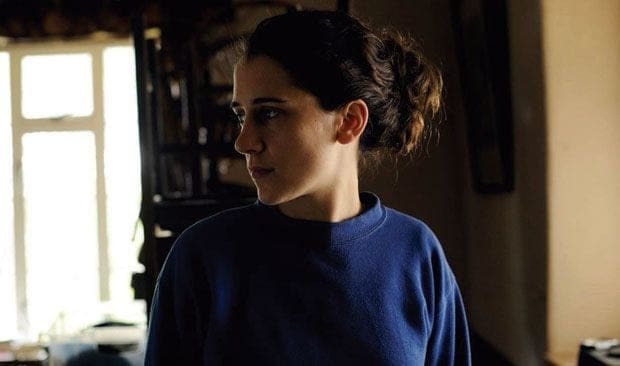 Writer-director Hope Dickson Leach, making her first feature film, appears to be spurred less by likes of Loach and Clio Barnard – although their influences are still visible – and more by the profoundly naturalistic work of the Dardenne brothers. Regularly capturing the action using a handheld camera, Leach deftly uses confined close-ups and narrowed angles to intensify the grief that’s shared by Clover & Aubrey, whilst also emphasising the guilt & disconnect that exists between them. As the funeral approaches, both father and daughter must seek to forge a new understanding, leading Clover down a path of emotional reckoning that forces her to face a past she would rather forget, and a future that suddenly seems so uncertain. Haunting performances from Kendrick & Troughton further accentuate the growing torment of the two central characters, but it is arguably the austere backdrops of Somerset that offer us a more pronounced and palpable sense of their suffering: DP Nanu Segal using the flat & forbidding countryside to augment a bracingly cold mood, which lingers with a stinging potency that perfectly underscores the power of Hope Dickson Leach’s assured debut. The Levelling is in cinemas from Friday 12th May.